Mussels Au Gratin works perfectly as an appetizer, particularly when the main course is fish, as well as a light lunch. You’ll appreciate the simple ingredients used in this recipe and are sure to love the crunchy texture the panko breadcrumbs give to the mussels, making them even more of a pleasure to eat. Be sure to use a quality cheddar cheese when making this, as it makes a big difference in the resulting flavor. We recommend Cabot Private Stock Cheddar or Cabot New York Vintage Cheddar. Feel free to share the recipe with friends and family on Facebook, Pinterest, Instagram, and Twitter. Preheat oven to 475°F and melt Cabot Unsalted Butter in a medium skillet. Pour 2 tablespoons of the melted butter into a small bowl and add panko breadcrumbs, tossing to combine, and set aside. Add canola oil to butter remaining in skillet and increase heat to high. Then add mussels, shallot, and garlic and sauté until the mussels begin to open. Then add half of the parsley and tarragon and sauté for an additional 1 to 2 minutes. Next, add heavy cream, white wine, and 2 tablespoons of grated Parmesan cheese, cooking until the liquid is reduced by half. 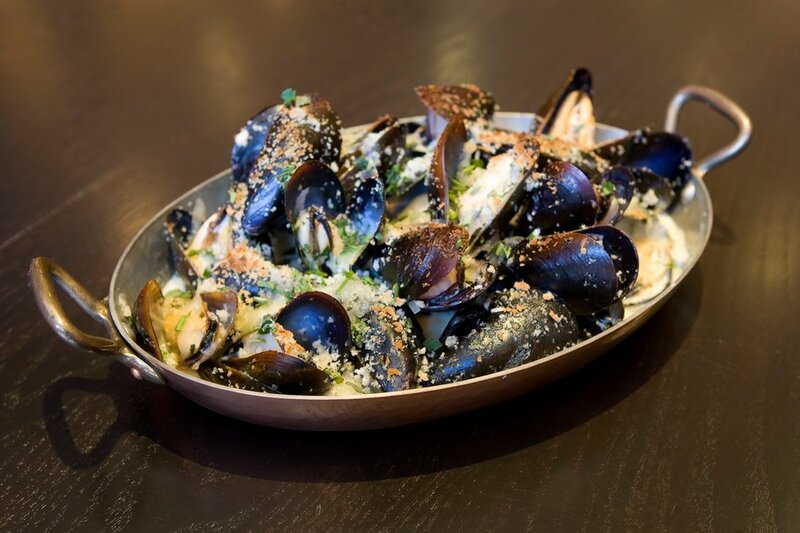 Transfer the mussels to an ovenproof baking dish and sprinkle the top with reserved breadcrumbs and cheddar. Bake until browned, about 3 to 4 minutes, and remove from oven. Sprinkle with remaining Parmesan and herbs to serve. In the mood for salmon? Make these Simple Salmon Cakes with Greek Yogurt. Cabot is a cooperative of over 800 farm families who continuously strive to produce the best dairy products around. If you enjoy this recipe, we’d really appreciate it if you could rate and review it! MELT butter, in medium skillet. Pour 2 tablespoons of melted butter into small bowl; add breadcrumbs, tossing to combine. Set aside. ADD oil to butter remaining in skillet and increase heat to high. ADD mussels, shallot and garlic and sauté until mussels begin to open. ADD half of parsley and tarragon and sauté for an additional 1 to 2 minutes. ADD cream, wine and 2 tablespoons of Parmesan cheese; cook until liquid is reduced by half. TRANSFER mussels to oven-proof baking dish; sprinkle top with reserved breadcrumbs and cheddar. Bake for 3 to 4 minutes or until browned. Remove from oven and sprinkle with remaining Parmesan and herbs. Recipe courtesy of Stephanie's on Newbury.